1. First off, we’ve been in contact for around 2 years, how is it possible that I’ve never done an interview with you? Am I the worst or what? We live in “interesting times” and such things often get overlooked. Do not fret, all is forgiven! 2. My readers know you from your nonfiction work that has been featured on the site: assorted tree folklore, a review of “A Druid’s Herbal of Sacred Tree Medicine”, and your award winning essay “Female Druids”. What they may not know is that you’re also an accomplished fiction writer. How did you evolve into also writing fiction? I don’t think I had a whole lot of say in the matter. I am convinced that the Spirits are “using me” for lack of a more elegant term. I am one of those people who has to write every day or I feel that I am not living up to my life’s purpose. Tackling fiction was terrifying at first. I was not an English major and my training has mostly come from reading voraciously since the age of five. I have now penned three novels. Happily I seem to have found a certain rhythm to the writing. After the first one or two chapters the characters take over and then all I have to do is follow them around. I am just a scribe, recording their actions and what they speak about. It’s rather like watching a movie unfold. All three novels take place in late Iron Age Ireland and Scotland. Only two are in print at this moment, “Priestess of the Forest: A Druid Journey” deals with the very first encounters between the indigenous Celtic tribes of Ireland and their Druids, with the Christian missionaries. It takes place several centuries before Patrick. He gets all the press but there were missionaries from Gaul and Coptic monks from Egypt actively converting people several centuries before Patrick appeared on the scene. It is written from the point of view of the Druids and includes rituals and ancient Celtic beliefs and practices. It also deals with the concept of sacred land as it was once understood by our European ancestors. Something we need to re-learn as a species if we are to have a future on this planet. The second book continues where the first one left off. “The Druid Isle” deals with sacred water and the mystical voyages of the Celts called immrama. It takes place in the Hebrides of Scotland on a real island where I was privileged to spend time in 1983. That island was once a holy place of the Druids but was taken over by Christians in the fifth century. The third book does not have an official title yet and it is sitting on the publisher’s desk awaiting approval. It deals with sacred fire on the land and in the sky. The three books make up a trilogy that honors Land, Sea and Sky, the mystical “Three Worlds” of the Indo-Europeans which form the basis of Indo-European cosmology. 3. 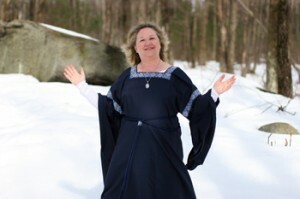 In 2008 “Priestess of the Forest: A Druid Journey” was published. Now the next book in the series, “The Druid Isle”, has released. Without giving too much away, what can readers expect from the new book? “Priestess of the Forest: A Druid Journey” is an introduction to rituals for all the holy days and life passages as understood from a Druid perspective. 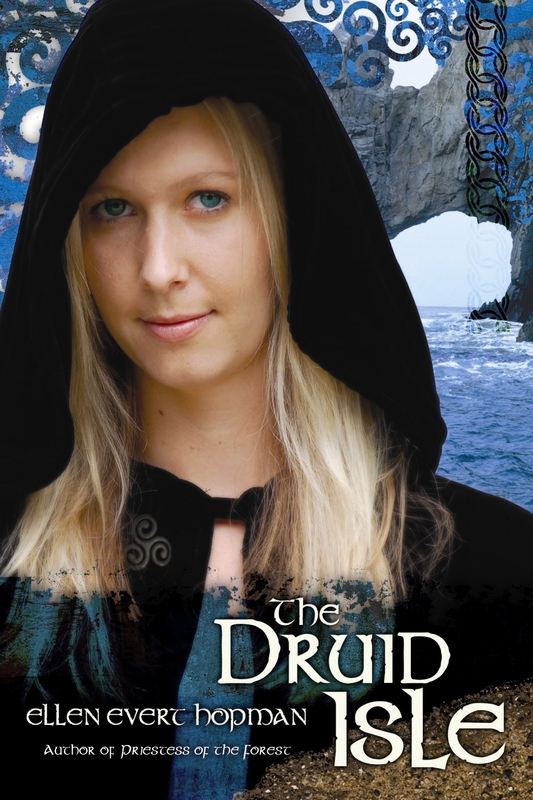 “The Druid Isle” goes more deeply into the actual training of a Druid or Fili (sacred poet). I would hope that the reader would understand Indo-European spirituality a bit more deeply after reading the second book. 4. “Priestess of the Forest” and “The Druid Isle” are fictional stories, but were carefully researched. What kinds of factual things can readers learn from these two books? There are details such as clothing, food, housing, weapons and relationships that are researched. However, much of it comes from my own imagination, vision or intuition, or from whatever Spirits are guiding this process. For example, “Priestess of the Forest” came out in February of 2008. In April of 2008 British archaeologists announced the discovery of the very first Druid grave. In my book the characters had shown me a Druid funeral rite which involved the herb Artemisia as a drink and as incense. When the archaeologists opened the grave they found inside a container that had last held Artemisia tea. So far nothing quite as dramatic has happened with “The Druid Isle”; however one interesting thing did come to my attention after I finished the work. The characters of the second book showed me how the Fili (sacred poets) of Ireland made a peaceful transition to accepting the Christians and one of the major characters in that process is named Lucius. Shortly after I wrote the book I learned that the very first Pagan Celtic king to build a Christian church on his land was named Lucius. He was British. These little confirmations show me that maybe somehow I am on the right track with all of this. 5. Do you feel that perhaps readers learn more from a compelling fictional story, rather than reading straight nonfiction? The Druids were and still are intellectuals. Once thing most Druids of today have in common is that we are avid readers and generally highly educated. In ancient times it was exactly the same. However, there are many folk out there who would rather read a fast paced novel with lots of warrior action and romance in it and get their history and teachings as a by product. Not everyone gets joy out of hefty scholarly literature. There are people who have thanked me for writing the books because they just didn’t have the temperament to read the scholarly tomes. I feel these books are a painless way into the mindset of the Druids and also a little primer on how to be a practicing Druid of today. 6. Now that “The Druid Isle” is published, what’s your next project that my readers can look forward to? As I mentioned there is a third Druidic novel waiting to be accepted by the publisher. I am also putting the finishing touches on a book of Highland herbs and Scottish lore. 7. Because my readers may be curious, you’re a Druid Priestess. How is a Druid different from a Wiccan or Pagan? “Wicca” is a modern religion that was invented in the 1930’s primarily by Gerald Gardner but with the help and inspiration of a number of others. If you want to learn how it was put together the best book I have read is Ronald Hutton’s “The Triumph of the Moon”. Wicca is duo-theistic and posits that “all the Gods are one God and all the Goddesses are one Goddess”. Wiccans cast circles and call in the four directions. Wiccans are cheerfully eclectic and find no harm in invoking Pan, Thor and Kwan Yin into the same ritual. “Druidism”, at least the kind that I practice, is firmly grounded in the folklore, language, music, art, religion, archaeology, beliefs, prayers, hymns and incantations of the ancient Celts. There are other types of Druids who are more Wiccan and some Druids who are actually practicing Masonry with a paper thin veneer of Celtic flavoring, but the type of Druidism I practice honors the Three Worlds of Land, Sea and Sky and addresses only the Celtic deities. We make offerings to water, fire and trees and try to use actual charms and incantations from genuine Celtic sources. 8. If any of my readers wanted to learn more about Druidism, where would you suggest they start? I would suggest going to the Whiteoak website and checking out the basic reading list. It was put together by fifty or more Druids specifically to cover all aspects of our beliefs, history and practices. When you have read five or more of the books feel free to apply to our discussion list (which is by invitation only). We also have a teaching program that leads to initiation for those who are so inclined. But the first step is always to do the reading and then get on to the discussion list. As a shameless self promotion I have to plug my own books, each of which is designed to instruct the reader in basic Druid spirituality. “A Druid’s Herbal for the Sacred Earth Year” takes you through the seasons and teaches the appropriate herbs to use for ceremonies and life passages such as weddings, funerals, house blessings, etc., giving the spiritual and medicinal properties of all the herbs. “A Druid’s Herbal of Sacred Tree Medicine” teaches about the Irish, pre-Roman, Ogham alphabet and specifically the oldest version which is called the Tree Ogham because the letters are all named for trees. In that book I teach the spirituality and medicinal uses of trees. I also teach about the Celtic Fire Festivals; Samhain, Imbolc, Beltaine and Lughnasad, and include a primer on Ogham tree divination. These and more of my books can be found on my website. As an author I really appreciate it when people go through my site to purchase books! 9. Have you found any portrayals of Druids in popular culture that you liked? I’d like everyone to look deep inside and ask themselves what kind of world they really want for all the Earth’s creatures. And then call your representatives and demand that they listen! Ellen Evert Hopman has been active in American Druidism since 1984. She is co-chief of the Order of the Whiteoak (Ord na Darach Gile), a popular author of Druidry-related titles including Priestess of the Forest: A Druid Journey and The Druid Isle (Llewellyn), and a master herbalist. She lives in Massachusetts. To learn more, visit her website, The Order of the WhiteOak (the Druid Order of which she is Co-Chief), Shrine of the Goddess Brighid (that she co-created with J. Craig Melia), Llewlleyn, and Dreamz-Work Productions (where you can get your copy of “Making Kitchen Medicines” which will soon be available from Amazon, Barnes and Noble and other outlets).